Love handles, chubby thighs, and fat under the chin are examples of unsightly bulges that may stick around despite exercise and dieting. 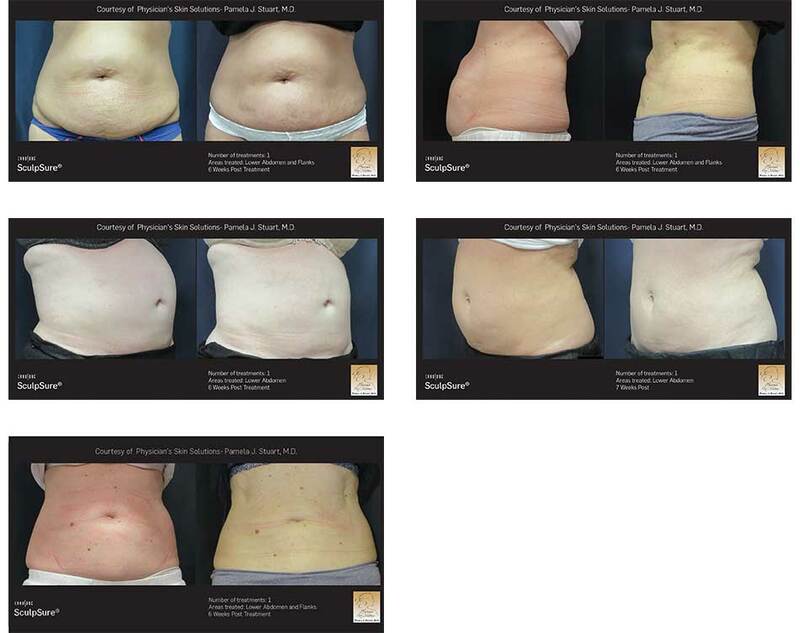 Dr. Pamela J. Stuart can help eliminate this type of persistent fat and contour your body to the shape you desire with safe, non-surgical medical procedures. Contact Physician’s Skin Solutions in Morgan Hill, San Jose, and Gilroy, California, to schedule a consultation to learn about our advanced body contouring procedures, SculpSure® and Kybella®. Non-invasive and minimally-invasive methods of body contouring can fine tune the shape of your body by eliminating those bothersome pockets of fat that stick around even when you follow a healthy diet and exercise routine. This type of body contouring, such as SculpSure and Kybella, works well for women and men who are close to reaching their weight goal. The technique is also appropriate for those who have reached a healthy weight, yet still don’t have the body shape they desire. Instead, they have love handles, a double chin, or some other area of fat that sticks around. SculpSure uses lasers to eliminate stubborn fat in some of the most common trouble spots, such as the abdomen, love handles, and thighs. This advanced medical device emits lasers on a controlled wavelength that can safely pass through your skin to reach fat cells. As laser energy heats the fat cells, they break down, then they’re naturally absorbed by the body. A single SculpSure session lasts less than 30 minutes, and if you have more than one problem area, multiple areas of your body can be treated at the same time. After the treatment, your skin may be red, slightly swollen, or tender, but you’ll be able to resume your normal activities. The process of eliminating fat cells is gradual. Some patients begin to see changes in about 6 weeks, but optimal results take closer to 12 weeks. Most patients lose nearly one-fourth of the targeted fat cells in one treatment. Kybella is an injection treatment that specifically targets moderate to severe fat below the chin, which is medically known as submental fat, but commonly called a double chin. Kybella consists of deoxycholic acid, which is naturally found in the body where it breaks down dietary fat. The same action occurs when Kybella is injected into submental fat, where it destroys the fat cells, then they’re eliminated by being absorbed back into the body. The treatment consists of multiple shots targeting submental fat, but it only lasts about 15-20 minutes. Dr. Stuart will make sure you’re comfortable during the treatment by using a topical numbing cream. Most patients need several treatments to get optimal results, but Dr. Stuart will talk with you and develop a treatment plan depending on the amount of fat to be eliminated and your desired results.